NewTek has posted a new pre-release update on LightWave 10 – and is inching closer to a definite shipping date for the software. The ’10-10-10′ preview, posted on Sunday, gives the product another spin around the promotional block between its official announcement at Siggraph and its eventual arrival in the hands of users. 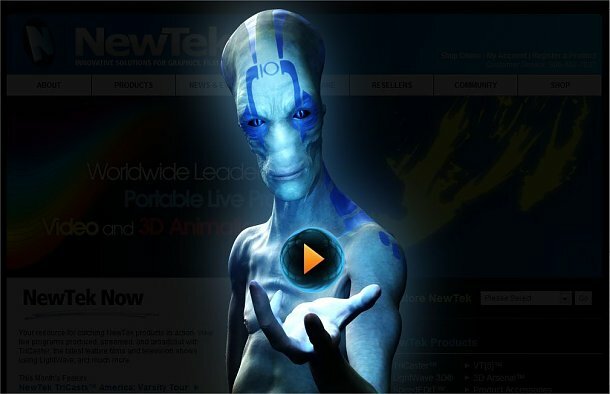 A video available on a gateway page to the NewTek website features talking heads from artists at Zoic Studios, The Asylum, Eden FX and Darkside Animation, linked by voiceover from NewTek’s new Vice President of Product Development, Rob Powers. Although there is little that will be new to anyone who caught the original product announcement, there are brief clips of each feature in action – and you sense that by foregrounding Powers, still hot from having set up the virtual camera department on Avatar, NewTek is playing one of its strongest cards. Further testimonials and Camtasia videos are scheduled for the next 10 weeks – we assume, leading up to the release date itself. NewTek will currently only say that LightWave 10 is “expected to be shipping before the end of 2010”, but with only two weeks in it between the final video and New Year’s Eve, it has to be pretty close.